Cintec are conducting a comprehensive program of testing to evaluate the performance of the Blastec anchor system within a diverse series of masonry structures. This continuing program started in 1990’s with tests sponsored by the UK Security Service and other related international agencies. Two identical 3m x 3m x 225mm (10ft x 10ft x 9in) solid masonry walls were constructed. One wall was reinforced by a number of Cintec Multibar anchors; the other was left unreinforced. Each wall was subjected to an explosion from a 6kg (18lbs TNT equivalent) charge at 1m (39in) stand off. The results clearly show the effectiveness of the Blastec solution. Two further identical 3m x 3m x 225mm (10ft x 10ft x 9in) solid masonry walls each with a mild steel plate ‘window’ were constructed. One window used conventional mechanical bolts; the other was strengthened using Cintec Multibar Window anchors. 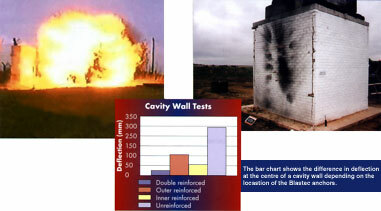 Each wall was subjected to an explosion for a 6kg (18lbs TNT equivalent) charge at 1m (39in) stand off. Blast pressures from small charges near to the target produce very high pressures: Further tests are planned using very large charges at greater standoff. Post test photo of a cavity wall masonry cube reinforced by Blastec anchors subjected to a blast load from 5kg (11lb) explosives at 1.2m (4ft).